It was all about the mood for Chanel this season. “It’s more about the mood of the times, not something you have to translate. It’s all about the wind, it’s in the air,” Karl told vogue.co.uk. The collection was filled with pearls-which were found on jackets and dresses and piled on necks and wrists. Volume was a theme throughout the collection as the emphasis was on the shoulders-giving us cocoon, bell and trapeze shapes. And how about a hello to that new hulla hoop beach bag. Karl never the one to shy away from branding everyday objects, once again ‘chanelified’ a popular used equipment. 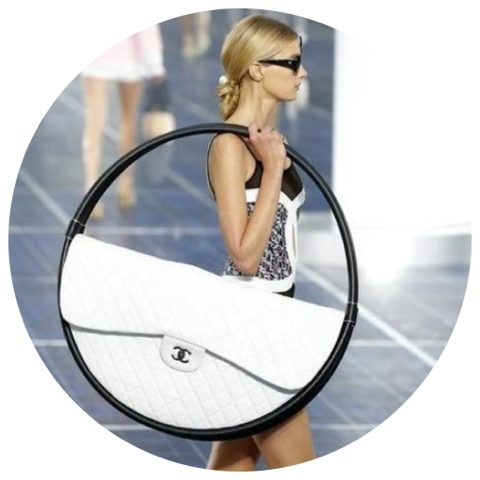 So long to the hulla hoop being a toy and hello to a new fashionable bag. What a lady Lanvin is! This time around the collect brought out a lot more black than what we’re used to seeing from this fashion house. The collection celebrated the woman’s body with seductive cuts all in the right places. Showing just enough to let you know she’s a woman, yet concealed enough so that you know she’s a lady. Elbaz confessed that he’s ‘square’ referring to the recurring theme of ‘the square’ throughout the collection. The show ended off with a lot of box cuts and short sharp dresses-which are more the Lanvin style we’ve grown to know today.